"You can't leave. She won't let you." Director Paul W.S. Anderson's choice of films have been more lightweight and gimmicky than dramatically substantial, with a couple of videogame treatments (Mortal Kombat, Resident Evil) and a tepid comic book offshoot (Alien Vs. Predator) as part of his catalog. With 1997s Event Horizon, Anderson moved himself into the fairly legit realm of sci-fi/horror with a dark, brooding story set in deep space that supplied a futuristic merging of the haunted house and outer space genres into a sleek, spooky package. Vocal Anderson detractors have always mocked Event Horizon as overstylized and pointless fluff, but there has also been a very loyal fanbase for this particular film. 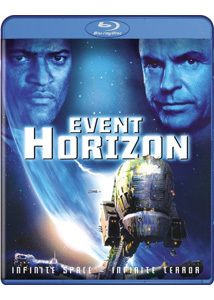 There's a lot of hard science mumbo jumbo in the dialogue, but it's mostly filler in between the creepy on this horror-in-space film, as the deep space rescue vessel Lewis & Clark is sent on a mission to the dark side of Neptune to search for the enigmatic ship the Event Horizon, which mysteriously disappeared years before. The Lewis & Clark's head honcho is the gruff Captain Miller (Laurence Fishburne), who has reluctantly brought along Dr. William Weir (Sam Neill), the man who designed the Event Horizon and is knowledgeable on things like dimensional gateways and gravity drives. It seems Weir's ship has the capability to travel between dimensions or bend gravity or something like that, which is all inconsequential because the short version is that wherever the Event Horizon was during its missing seven years, it has come back as something very, very evil. The look of the finished product is both grubby and hi-tech, with Anderson creating a darkly stylized and somewhat familar vision of space travel, one that owes more to Aliens than Star Wars, with Miller and his colorfully cranky crew instantly regretting the mission once they encounter the now desolate Event Horizon, not so ironically with its grinning rictus Alien-head like appearance. There are jumpscare visions, dangerous spacewalks, disembodied voices, and a massive rotating gravity drive that has apparently become a portal of sorts, and all of this leads to a few supporting player deaths and a balls-out battle between Miller and your basic vengeful manifestation of Hell. Operating more on style than substance, Anderson slathers on visceral layers of haunted, claustrophobic menace, as the Philip Eisner (Firestarter 2) screenplay builds to its inevitable explosive climax that may raise some logic and physics questions, but is fun, regardless. I've always been in the "like it" camp for Event Horizon, and it is easily the often maligned Anderson's strongest work. And in this era of overblown, three-hour "epics" this one moves fast, with a runtime just over 90 minutes, and that is probably one of the film's hidden strengths. It's a lean story to be sure (crew finds haunted spaceship), so the buildup and payoff are presented efficiently and with little in the way of excess fat. Image Transfer Review: Presented in 2.35:1 anamorphic widescreen, the MPEG4-AVC codec used for this transfer still carries many of the same occasional miscues found on the SD release, beginning with the truly awful and grainy Paramount logo at the open. There's also some moderate specking evident, so it appears that this print hasn't undergone any major technical scrubbing. On the plus side are the fleshtones, which more than hold their own throughout, and an improved level of skin textures; ditto for the surface of the ships Lewis & Clark and Event Horizon, which now reveal much more subtle detail. The size of your display may be the ultimate judge of how well this disc looks, as some of the slight flaws evident here are more pronounced on BD than before. I expected more from the BD treatment, so the lack of a significant "wow" factor drops this one a grade below the SD release. Audio Transfer Review: The main audio track is provided in 5.1 Dolby TrueHD, and while the SD release included a mighty fine DTS mix it really matters little that it doesn't show up here. This is one of those minor showcase audio presentations, and for an older title that seems doubly impressive. A heavy LFE presence will really put your subs through a workout, and may require a slight adjustment unless you want pictures falling off your wall. Voice clarity is excellent, with most of the dialogue locked in the center channel, while the remaining channels get utilized with surround cues and directional pans. French and Spanish 5.1 dubs are also included. Extras Review: The non-HD supplements match the content found on the 2006 2-disc special edition, only here it's all on one. The only difference is a few more subtitle options and the absence of four trailers for other Paramount titles. The film is cut into 17 chapters with optional subs in English, English SDH, French Spanish or Portuguese. There's also a commentary track from director Paul W.S. Anderson and producer Jeremy Bolt, with the two Brits chatting amicably in nearly identical voices about the usual casting, script and production issues, including acknowledging the criticisms of some of the dialogue that they claim was supposed be get a laugh. The mood is fairly upbeat for such a dark film, though at times a little bit too full of reverential self-praise. The biggie is the five part doc The Making Of Event Horizon (01h:42m:55s), which oddly enough runs longer than the feature itself. Divvied in separate sections, each detailing a particular aspect of the production, the segments are the origins and initial development issues with Into The Jaws Of Darkness (14m:57s), the design of the spacecraft in The Body Of The Beast (22m:48s), "the Hell stuff" in Liberate Tutume Ex Infernis (19m:54s), the specials effects are covered in The Scale To Hell (18m:41s), and The Womb Of Fear (26m:35s) looks at the hectic post-production schedule. A single deleted scene and two extended scenes (10m:03s) are available with optional Paul Anderson commentary, as is The Unseen Event Horizon (02m:57s) which offers director commentary on storyboards of an unfilmed rescue scene and an automated set of Conceptual Art (06m:53s). The Point Of No Return (08m:12s) is quick four-part set of behind-the-scenes footage, also available with Anderson commentary. Things wrap with a pair of trailers, one for the theatrical release (presented in HD), and a grainy SD one for the video release. The BD treatment of this creepy, atmospheric sci-fi/horror film with the substantial cult following comes a couple of years after the fine SD 2-disc set, and while there are no new extras the image transfer shows a marginally measurable improvement (yet still not quite perfect). The TrueHD track, however, has all the deep punch of the previously offered DTS mix. Not an essential upgrade, but worthwhile if you passed on this one first time around.